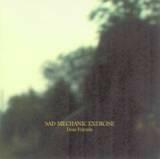 Sad Mechanic Exercise - "Dear Friends"
Here is another limited edition Acoustic Desaster release. This one features a three piece band who are doing a sort of tribute to Edwin Arlington Robinson using all of his words for the basis of their songs, including the title, Dear Friends. Edwin lived from 1899-1935. The CD features 10 tracks in 26 minutes and, like Henry my Son, they are using the words from a famous person, and they share the same singer (speaker). The introduction track is totally different for this band, which are far more experimental, psychedelic and strange, but then the music enters into the same sort of realm of Henry my Son, so if you like that one, you will probably dig this one as they are brothers in music. Very laid back stuff with quite minimal playing as the words take the center piece.